With the passing of founder member Edgar Froese and new members Ulrich Schnauss and Hoshiko Yamane now fully established, the new look TANGERINE DREAM is now an entirely different beast to the one which played its last London show at the Shepherd’s Bush Empire back in 2014. 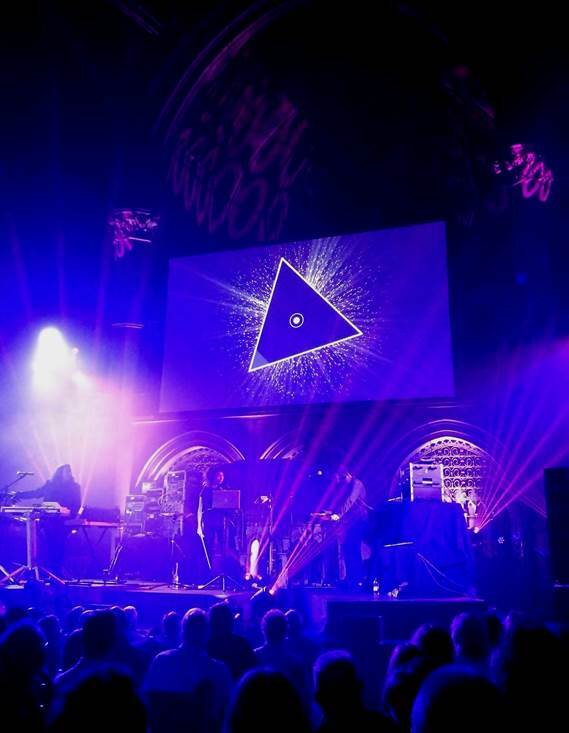 The fact that tonight’s show was sold out and the following one was close to capacity showed that there was a huge weight of expectation with these two long-awaited London dates at Union Chapel. For those familiar with the beginnings of the band, having a church as a venue harked back to TANGERINE DREAM’s early gigs, many of which took place in cathedrals. The band opened with a version of ‘Monolight’ from the 1977 album ‘Encore’ and wasted no time in settling into the trademark interlocked sequencer parts that TANGERINE DREAM are now rightly famous for. 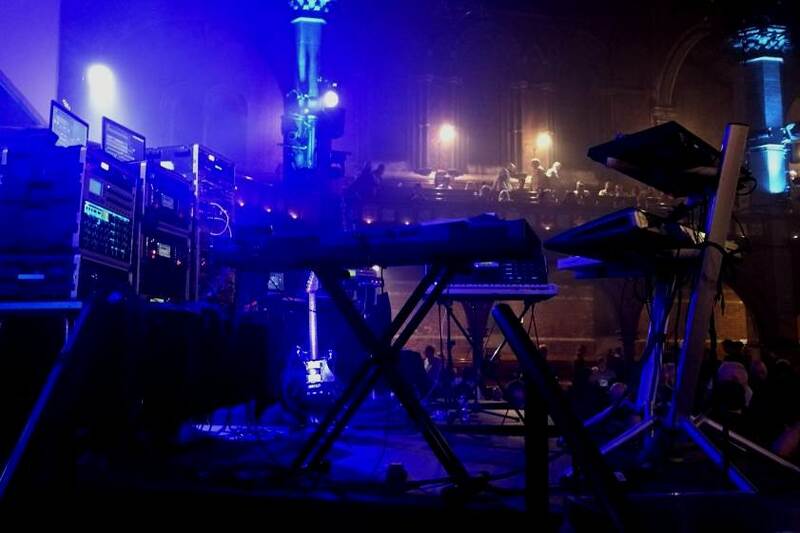 The stage set-up was Thorsten Quaeschning on the left with an enviable mixture of kit (including a Moog Voyager, Manikin Schrittmacher Sequencers and Memotron), Ulrich Schnauss on the right on additional synths / sequencer and centrally positioned on violin and Ableton duties Hoshiko Yamane. ‘Betrayal’ from the 1977 ‘Sorcerer’ soundtrack followed and it was obvious that the band weren’t going to be afraid to dip into their quite considerable back catalogue of 150+ albums and counting! ‘Kiew Mission’ was up next from the ‘Exit’ album and the welcome inclusion of ‘Dolphin Dance’ from ‘Underwater Sunlight’ added in some welcome percussive elements with a beefed-up drum pattern upping the energy level of the gig. 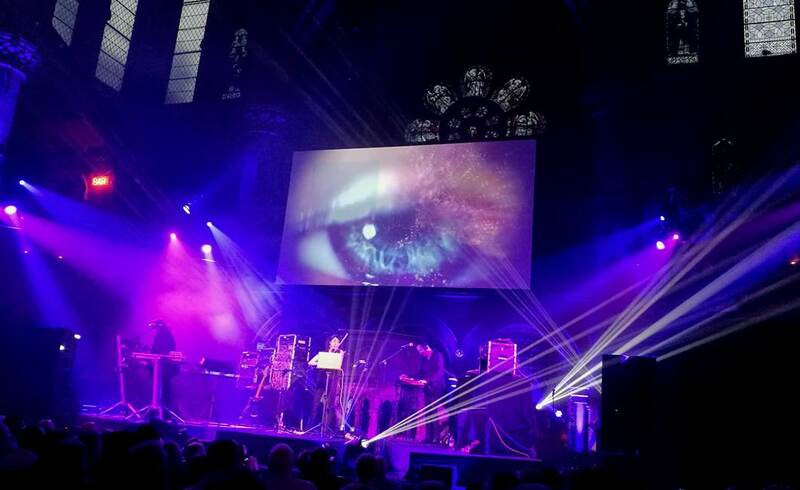 One of the criticisms that The Electricity Club made of the previous London gig was that the visual elements on the projection backdrop were akin to a dodgy Windows 95 screensaver, thankfully those on show tonight were much improved and provided a stronger visual accompaniment to the music along with some dramatic shafts of lights which illuminated the wonderfully ornate Union Chapel venue. Newer material in the form of the awkwardly titled ‘It Is Time To Leave When Everyone’s Dancing’ and ‘Roll The Seven Twice’ (with its ‘Age Of Love’-style trancey sequencer part) were also represented, but the biggest reception was firstly reserved for ‘White Eagle’. Started with ethereal/filtered pads by Schnauss on his Roland JD-XA, the track’s haunting sequencer pattern and TR808 style percussion gave way to the haunting melody line counterpointed by Yamane’s violin work. ‘Stratosfear’ sounded absolutely immense, still possessing one of THE iconic synth melodies, this version did the original version total justice and a wonderful ‘edited highlights’ version of the twenty minute plus ‘Horizon’ from the live ‘Poland’ album followed. What impressed about the ‘Horizon’ version was that the wonderful rolling Chris Franke bass sequence was kept intact and cut through the PA system superbly. To climax the evening the band performed what is now come to be known as a ‘session’; an improvised piece in the spirit of TANGERINE DREAM’s early gigs. Although a bit meandering in places, it was hard not to be transfixed watching electronic music being created pretty much on the fly in an era when it is far too easy to rely on backing tracks and let your computer do all the work for you! It is really heartbreaking that Froese is not around to see how his band has evolved so much in such a short time, the impact of Schnauss joining can’t be underestimated too. He appears to have a really strong understanding and sensitivity towards TANGERINE DREAM’s back catalogue and being a self-confessed fan before joining, has helped mould and shape (alongside Quaeschning and Yamane) a setlist which plays to the band’s strengths whilst not being afraid to subtly update certain elements. 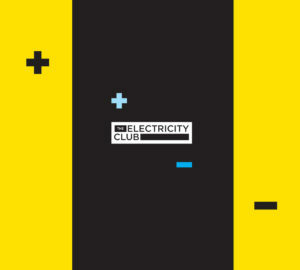 The main criticisms that The Electricity Club would level at tonight’s show are that Quaeschning’s guitar was virtually inaudible during most of the gig and Yamane still feels woefully under-utilised; she is obviously a really gifted musician and even for her sake, it would be great if she could be given more involvement in the set. 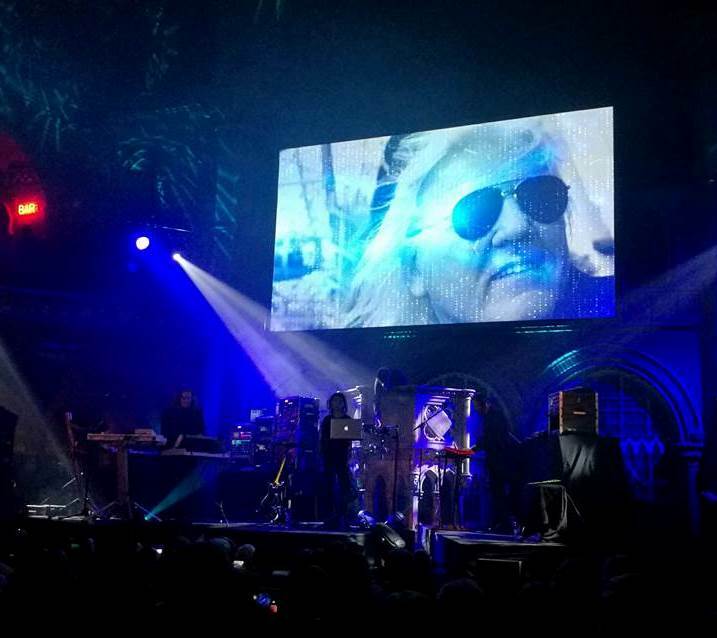 Tonight’s show was a fitting tribute to Edgar Froese, there will still be those that argue that “this isn’t Tangerine Dream without him!”, but it was his wish that the act continued on and the line-up now is plainly not just trading on past glories. 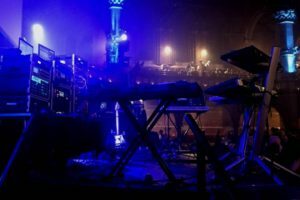 The band are creating new material which is arguably the best that has been produced in years and the return of the ‘sessions’ based improvising is helping to reclaim some of the ground lost when the band featured sax and live percussion, which to many felt at odds with the original TANGERINE DREAM ethos.